After 14 months of cracking down and reaching the pinnacle of performance, the team at ROUSH Peformance took the wraps off their latest & greatest project, the 2010 ROUSH Ford Mustang. 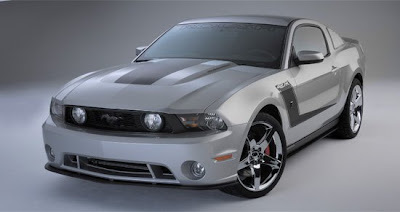 Luckily for the rest of us, we won't have to sit through just over a year of the R&D storyline to see the 2010 ROUSH Mustang go from concept to car. The SPEED channel will soon broadcast a behind-the-curtain look at the making of the fifth installment in the ROUSH Mustang legacy. Several clips were assembled for a comprehensive look at some areas which are normally off-limits to the public such as the modeling studios, the assembly line, and the Cooper Tire & Vehicle Test Center. Included with the design and production backstory will also be some featured guest spots from Chip Foose, John Force, Carl Edwards, Matt Kenseth, and Greg Biffle. Keep reading to get the specific show air dates and more in the press release from ROUSH. 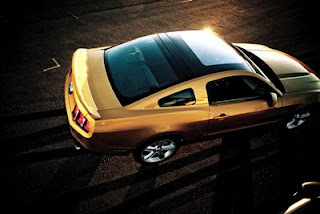 LIVONIA, Mich. (July 6, 2009) – It took fourteen months for the ROUSH® 2010 Mustang to go from design sketches to the dealer showroom floor, but you can see the entire process in one hour. SPEED will premier a special behind-the-scenes documentary on the making of the fifth generation ROUSH Mustang on July 20 at 8 p.m. (Eastern). The show, titled “2010 ROUSH Mustang: The Art of Performance Engineering” will take viewers through the countless steps and hundreds of thousands of hours necessary to turn a car from a concept sketch into one of the finest high-performance vehicles on the market. You’ll see the boardroom drama, the trade-offs that have to be made, and the official unveil before a throng of media and fans of Jack Roush and his vehicles. Footage was captured in several areas where cameras are normally strictly forbidden, such as the clay modeling studio, ROUSH Manufacturing and Vehicle Assembly, and the Cooper Tire & Vehicle Test Center near San Antonio. Additionally, the show will feature special guest interviews with luminaries such as Chip Foose, NHRA Drag Racer John Force, and NASCAR Sprint Cup drivers Carl Edwards, Matt Kenseth and Greg Biffle. *"ROUSH" is a registered trademark of ROUSH Performance Products, Inc., or its related entities. Ford is the established leader in tough trucks, and the Ford Special Vehicle Team (SVT) has raised the performance bar! Introducing the all-new 2010 F-150 SVT Raptor! It's the purpose-built, high-performance, no-excuses truck with the credentials to take on challenging off-road adventures and versatile enough to handle everyday life on pavement. F-150 SVT Raptor is tough, fast and built with performance in mind. The aggressive appearance is shapeed by performance needs. The distinctive "brick wall" grille includes 'integrated marker lamps' that accent the imposing stance and make Raptor 'street legal'. 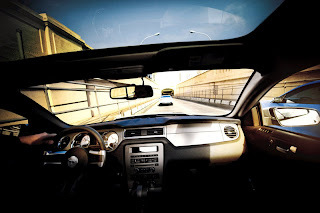 The power dome hood features 'functional heat extractors' to help lower underhood temperatures. Front fenders include 'additional heat extractors' and are flared to provide the room for '7 additional inches of front track width' and the '35 inch BFGoodrich all-terrain tires wrapped around 17-inch cast aluminum wheels. It's also impossible to miss the 'massive front skid plate' keeping the engineand transfer case protected. Every detail is aimed at delivering serious "Off-Road" capability. 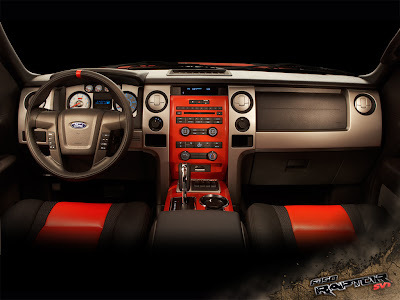 Raptor offers an interior designed to handle the dunes or driving in town. 'Auxiliary switch panel' on the center console makes aftermarket customization easier, with four prewired switches attached to the power distibution box for electrical accessories. Hill Decent Control and Off-Road Mode are also located on the auxiliary switch panel. 'Leather-wrapped steering wheel includes thumb pads and an orange leather strip that serves as a centering sight line--especially useful in extreme driving maneuvers that can cause the driver to lose perspective of the steering wheel's center point. "Leather trimmed seats offer comfort, and are designed with unique bolstering to help keep you planted in the seat when the going gets a little rough. 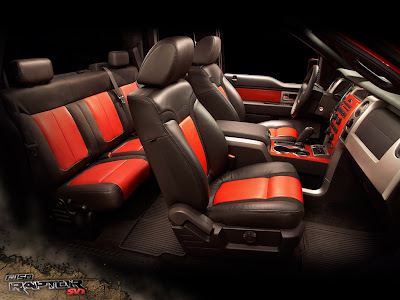 The seats in the photo above are included with the available Interior Appearance Package with orange inserts. Raptor not only has the chassis designed to soak up the rugged off-road, it has the technology and the capability to perform. 320hp and 390 lb-ft torque are on tap from the 5.5L SOHC V8 FFV engine. Or choose the optional 6.2L SOHC V8(coming winter 2010) delivering an estimated 400hp and over 400lb-ft torque. Both engines are mated to a 6-speed automatic transmission. The Electronic Locking Rear Differential uses a true mechanical connection to lock the left and right axle shafts together so both turn at the same speed with the same amount of torque. This switch-controlled feature maximizes traction capability at the wheel with grip, without having to stop the truck. The power sent to the wheels via a serious 4.10 axle ratio. 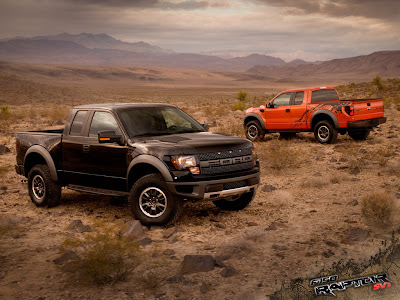 Building a high-performance off-road truck isn't all about horsepower, although the Raptor has plenty of that! 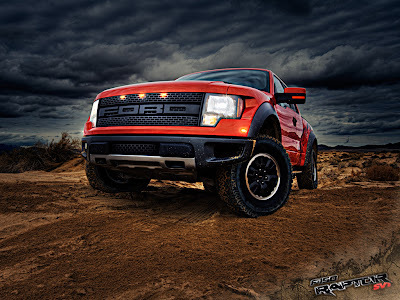 A serious off-road truck starts with the right suspension, and the Raptor has the goods. 'Fox Racing Shox' use a patented internal bypass system to provide position-sensitive damping for the Raptor shock absorbers. This allows for softer damping at ride-height to help improve traction, stability and comfort. Stiffer damping toward the end of the shock absorber stroke allows the Raptor to be driven more aggressively without bottoming out. The bottomline: Raptor offers an impressive 11.2 inches of suspension travel in front and 12.1 inches of travel in the rear.